The VivienB's Heritage Lace collection of wedding stationery is available from Thame, Oxford, and includes save the date, wedding invitation, evening invitation, order of service, table plan, menus, guest personalised mini menus, table name/numbers, guest name place settings and thank you cards. Classic in every way; The Heritage Lace collection radiates style and sophistication. Available in Cream or White as standard with plain white or cream envelopes. Large variety of other textures and colours available. Contact us to discuss prices and sample options. Just one of the beautiful wedding invitation and stationery ranges available at VivienB's of Oxford, Oxfordshire. The VivienB's Heritage Lace Collection. Available as: Save The Date, Wedding Invitation, Evening Invitation, Order Of Service, Table Plan, Menus, Guest Personalised Mini Menus, Table Name/Numbers, Guest Name Place Settings, Thank You Cards. Different formats available upon request. Colour changes of font, ribbon and embellshments are free of charge for all stationery items. Request a quotation and sample. Available as day wedding invitation or evening wedding invitation. Includes DL pocket with lace and ribbon embellishment, invitation with lace and ribbon embellishment, two DL inserts of your choice and envelope. 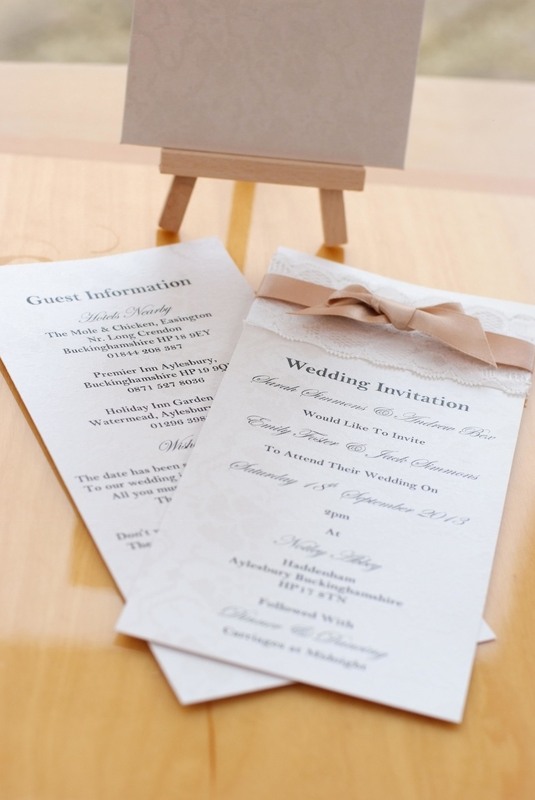 As standard, all invitations include high quality white or cream plain envelopes. We do, however, offer the option to upgrade your envelopes to match the Luxury Broderie card used in your invitations. A4 single card folded with or without ribbon binding. Provides two sides of internal text and 1 side on the reverse. Additional order of service inserts available. In the Heritage Lace collection design with your choice of coloured backing card and embellishments. Option of mounted on backing board or suspended with ribbon. Includes frame hire, if required. Refundable frame hire deposit: £25 (See VivienB's Terms and Conditions of Use). For when you have set the wedding breakfast menu for your guests. Can be placed centrally on your guest tables for all to see. Ideal if you have allowed your wedding guests to choose their own menu. Can be used as a place setting for your guests and serves as a reminder of what they have ordered for their wedding breakfast meal. Includes guest name and menu option personalisation onto each menu. To use in conjunction with a Table Plan to assist your guests in finding their table. Give your guests a helping hand to find where you would like them to sit. Fully customisable for napkin name tag or folded card placement on the table. Includes guest name personalisation onto each card.